Al-Markaz football team, 2005 champions of the Occupied Palestinian Territories, are on their way to Ramallah to play in a two-day tournament between the West Bank’s eight best teams. The event is sponsored by a Swiss aid agency. On the outskirts of their home city of Tulkarem the team bus waits for two hours at the Israeli military checkpoint on a dusty unmade road. When it reaches the front of the queue, the manager Sami Houji gets off the bus with his players’ green Tulkarem IDs in his hand. Two soldiers barely out of their teens but armed like storm troopers glance at them. One wags his finger. “No men between 16 and 40 can leave Tulkarem.” Sami explains about the tournament. Nothing doing. Orders are orders. Despite an hour pleading with the District Commander, and phoning the Red Cross and Israeli human rights organisation Hamoked, the answer is the same. “Security.” Sami returns to his despondent team and the bus turns back. Al-Markaz is from Tulkarem refugee camp. Stopping their football team could be seen as revenge for the two suicide bombers who came from there. But it also punishes a whole town that has little to be joyful about: its economy has collapsed due to Israel’s construction of the Separation Barrier and the restriction on movement of goods. With unemployment at 60%, football is one of the few things that alleviate the harassment and humiliation of the occupation. Tulkarem isn’t the only team with problems travelling to away matches. FIFA agrees that since 2000 Israeli army checkpoints have made it impossible to develop a Palestinian league. Stories abound on the West Bank of team buses being turned back, delayed so much they miss the games, getting stuck on earth mounds, and players being taken off buses and arrested. Even if Al-Markaz had managed to get out of Tulkarem on that day, they faced four more roadblocks before reaching Ramallah, a 50-mile journey that now takes an average of 6 hours. And there is no travel at all for Palestinians between the West Bank and Gaza. Palestinian football fares no better at national level. During the World Cup qualifiers, the Palestinian team’s Austrian manager Alfred Riedl struggled to put a team together at all. 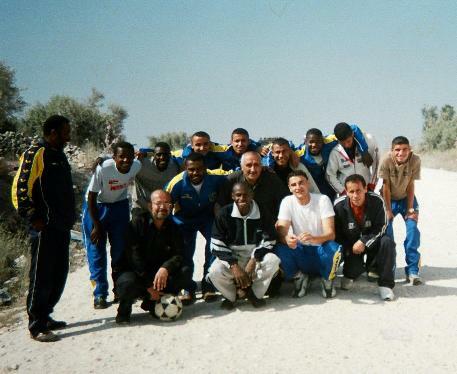 In August 2004 with the squad already training in Egypt, ten of their players were trying to get out of Gaza through the Israeli-controlled Rafah crossing. All were refused for two weeks until shuttle diplomacy between FIFA, the Palestinian Football Association and the Israeli authorities finally resulted in five been let out. Still with too few players Riedl put adverts on football websites for Palestinians from the diaspora not requiring Israeli permission to play. Currently half the squad is from Chile, the largest Palestinian community outside the Arab world. In April 2006 Israeli army missiles destroyed the Gaza Strip’s only football stadium in order to “send a strong message to the Palestinian people.” This is collective punishment, which contravenes the 4th Geneva Convention. It has been suggested that Israel be disqualified from the World Cup for hampering a legitimate competitor from legitimate preparations and the ability to field its strongest side. All this begs the question how Arsenal can sign a sponsorship deal to promote Israel as a tourist destination when Israel denies Palestinian footballers the human right to compete equally at national and international level. And how can Thierry Henry, in the forefront of the campaign to kick racism out of football, support a deal with a country that, to quote Nelson Mandela, “perpetuates a system of gross racial discrimination and inequality.” Not only do Palestinians suffer in the OPT but Arab players in the Israeli league are routinely abused from the stands. The deal with the Israeli Tourist Board endangers both Arsenal and Henry’s anti-racist reputation. So, in the run up to the World Cup when passions are running high everywhere, spare a thought for football fans in Tulkarem. Fortunately for the tournament in Ramallah, Al-Markaz were the only team not to make it that weekend. 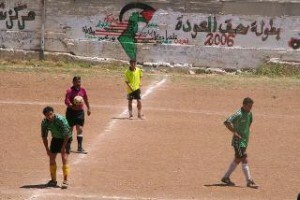 But this only added insult to injury because it was won by their arch rivals Al-Amaari from the Qalandiya refugee camp. Worse still, a week later the visiting team bus was turned back at the Anapta checkpoint into Tulkarem, so there is now no play either home or away. Al-Markaz will, however, be representing Palestine in the Arab Cup in Saudia Arabia in September, 2006. Manager Sami Houji says “It’s easier for us to travel a thousand miles to Riyadh than to play our neighbours Jenin twenty miles away”. “The chances of travelling are getting less and less. It’s easier for us to travel a thousand miles to Riyadh than to play our neighbours Jenin twenty miles away”. Footnote: On July 10th, the Israeli Air Force fired a rocket at four 16 year-olds as they were playing football on a pitch near Havel Abdel Hameed Secondary School in Beit Hanoun, Gaza. Three were killed and one badly injured.